The first standalone campaign pack for the historical strategy game puts players in the middle of Julius Caesar's war against the Gaulish tribes. 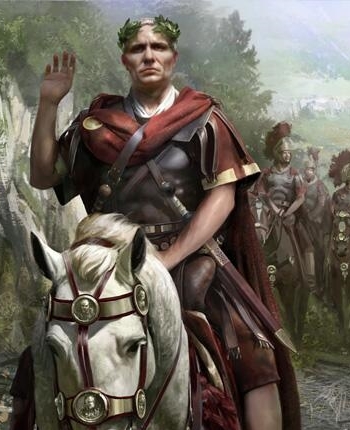 Caesar is on the march in the new expansion for Total War: Rome II. Set between 58-51 B.C., the Caesar in Gaul standalone campaign announced today is inspired by Caesar's Commentarii de bello Gallico (Commentaries on the Galllic War). The DLC adds a new campaign map with four playable factions, a new historical battle (the Battle of Alesia), and new units. The four playable factions in the new campaign are Rome, the Gallic Arveni, the Germanic Suebi, and the Belgic Nervii. The Arveni, Suebi, and Nervii also become playable factions for the core Total War: Rome II campaign. "We've released a number of DLC packs and free content updates for ROME II, but this is our most substantial so far," says Mike Simpson, creative director for the Total War series. "We've always planned to focus more closely on some of the key conflicts of the ancient world, and Caesar's war in Gaul is the ideal place to start," says Simpson. The new campaign focuses on a much narrower span of time, with each turn representing two weeks instead of a year. The shorter turns mean that seasons have made a return to the game, affecting production and other aspects of gameplay. Compared to what was available in the core campaign, the campaign map for Caesar in Gaul is a more detailed and expanded version of Gaul and parts of Britannia. Total War: Rome II is Creative Assembly's most successful entry in the Total War franchise to date. Simpson says, "We've also improved the game considerably since launch, and that process continues as we move onto substantial feature and gameplay improvements." Developer Creative Assembly has released several patches since release to fix bugs, improve the AI's decision making, and reduce video memory requirements. Full details for the standalone campaign pack are available on the Total War forums. The Caesar in Gaul campaign pack costs $14.99, and release is set for December 12.